We recently went to an event where they served a pesto pasta mixed greens salad. It was ok, and my immediate thought was that we could make the same dish at home -- but make it even better, and more flavorful. Plus, we've been needing to harvest some of our basil (that's been thriving - woohoo!) and could use it in the pesto. Pesto is so easy to make -- just blend up some basil leaves, pine nuts, Parmesan cheese, extra virgin olive oil, salt & pepper. Here's an Ina Garten pesto recipe if you need one. 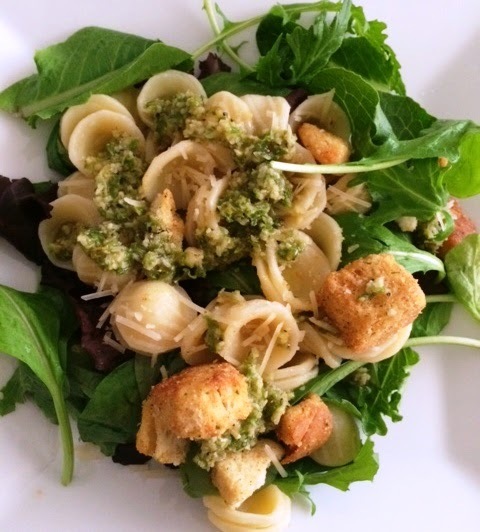 So, we made the pesto, and mixed it in with some mixed salad greens and orecchiette pasta. Topped it with some Parmesan and then croutons for some crunch and voila - dinner in just about 15 min!